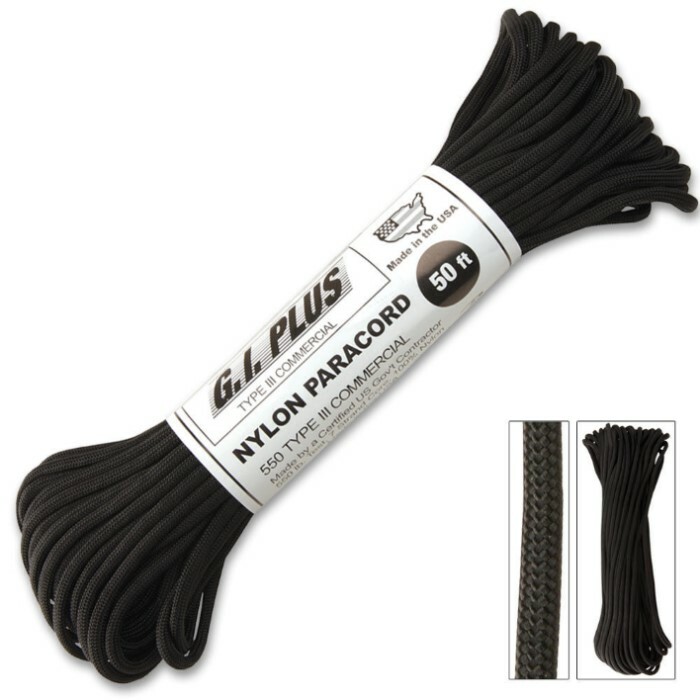 "50-ft. 550 lb Type III Commercial Paracord, Black"
This isn&apos;t that cheap, garbage paracord from overseas, this is pure American muscle paracord made in the USA by a U.S. government contractor. You can bet it will hold its 550-lb. rating and look good doing it in its flat black color. This Type III paracord is constructed of 100% nylon with an impressive 7-strand core, you won&apos;t find a tougher cord anywhere! This is the good stuff. I love wrapping my knife handles in paracord. Thanks trueswords! Just some simple paracord, it has many practical uses and is more than worth 4 dollars. This paracord is smaller than I expected, but that's what I wanted. I have no use for it now, but I intend to have use for it in the future. Perhaps in crisis/apocalyptic event? I'll pack this wherever I travel long distances. For $4, its a pretty hefty deal. I would suggest this to anyone that is considering buying any paracord. Unless, however, you want to buy the paracord bracelet. The only reason I chose this over the bracelet is that the length of the paracord in the bracelet is impractical. Depending on the task, id say only a few can be done before all of it is gone. However, this 50 feet of paracord would complete several tasks without running out. 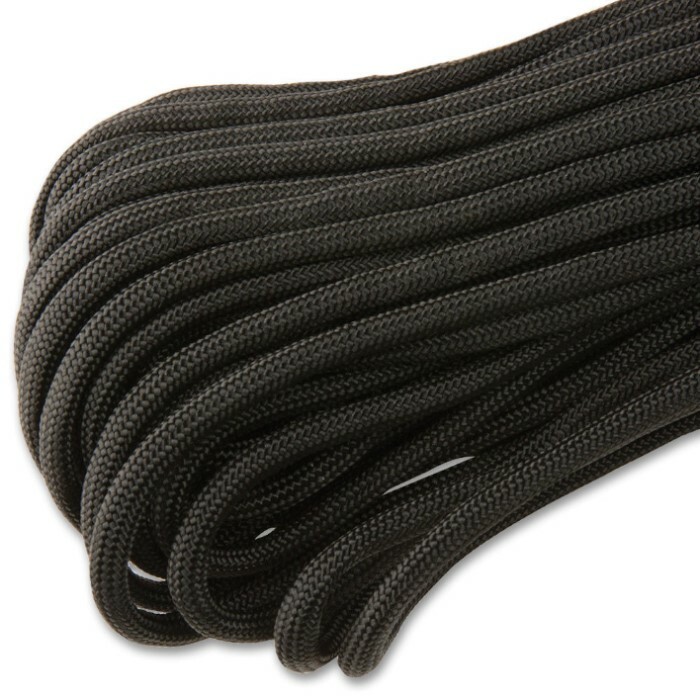 50 feet of strong, lasting, paracord able to take up to 550 lbs. Strong, stealthy, and compact. because of the thinner rope it stays small enough to take anywhere, but doesn't sacrifice its ability to hold weight. it can hold 550 pounds but the rope is less than a 1/4 inch thick. i didn't believe it until i started to roll down a hill and grasped this rope at the last second before i hit the rocks at the bottom of the hill. thanks paracord and thanks true swords. Good hold. Cuts nice. I use it over any rope. Awesome. What can I say? It's 50 feet, black, and while I can't properly measure it I would say it's a good deal stronger than clothesline. Great price, great product. Using it to replace old fraying nunchaku cords. Great price, looks nice, and works well. Buy it.